You’ve heard of SOPA Blackout Day. Well get ready for Stop Cyber Spying Week. After catching drift of the Cyber Intelligence Sharing and Protection Act, or CISPA, Internet advocacy groups sprung into action this week to express outrage at this latest attempt by Congress to flout due process in its crackdown on suspected copyright offenders. Spearheaded by well-known civil liberties groups such as the Electronic Frontier Foundation (EFF), the Center for Democracy and Technology, and the American Civil Liberties Union (ACLU), this week of action is aimed specifically at informing the public about CISPA and equipping them with the necessary means to make their voices heard. Forms of protest include a Twitter-based thread united by hashtags #CongressTMI and #CISPA, as well as letters of opposition and articles addressing specific civil liberties concerns about the language of the bill. This is significant not only because of its implications with regard to copyright enforcement but also its potential impact on would-be whistleblowers hoping to maintain lawful and ethical behavior in government as well as private institutions. By placing these issues under the care of the ultra-secretive National Security Agency and the powers given it by the 1947 act, those deemed by the agency to be in possession of such “cyber threat intelligence” run the risk of something far more serious than having their websites shut down without so much as a court appearance. Taking it a step past the punitive measures that would have been employed by SOPA—whose death was officially announced just last week—CISPA threatens to label suspected offenders as national security threats. Sponsored by a bipartisan pair of Congressmen—Rep. Mike Rogers (R-MI) and Rep. C.A. Ruppersberger (D-MD)—CISPA is currently scheduled to go to the House floor for a vote next week. So time is in short supply. However, there is still plenty that those of us who oppose the bill can do to make our voices heard. Contains dangerously vague language to define the range of information that can be shared with the government. Transfers cybersecurity responsibilities to a clandestine, minimally accountable agency like the NSA. Permits the use of information shared with the government for non-cybersecurity purposes. Petitions such as the ones here, here and here are also circulating the Web accumulating signatures. Meanwhile, after releasing a new “discussion draft” of the bill, the House Intelligence Committee alleged in a tweet that “[n]othing in CISPA provides any authorities requiring companies to take content off the Internet or to stop access to websites.” However, given that shutting down websites was secondary compared to concerns about the bill’s broad language regarding information sharing—not to mention the possibility of being labeled a national security threat—advocacy groups have remained steadfast in their opposition of CISPA. 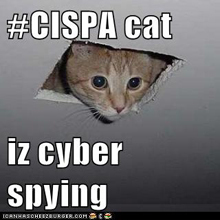 What’s your stance on CISPA? Share your thoughts and concerns in the comments below.